When I first came to Vietnam, back in 2005, I visited Nha Trang and loved it. The beaches were gorgeous, the people were friendly, and the strong expat presence beckoned me. I stayed for a few days, then returned again, drawn to the carefree lifestyle that this resort town offered. These days, I call Da Nang—a 90-minute flight up the coast—home. But all the things that attracted me to Nha Trang are still there today. I recently returned to the city on a scouting trip. I saw that there are lots of new resorts and even more restaurants and bars, but in many ways, the progress has significantly improved the town. The beach is clean and inviting, the locals are still welcoming and friendly, and the cost of living is still one of the lowest in Vietnam. This lovely seaside resort town boasts one of the most beautiful bays in the world. The coastal area consists of dramatic bays and wide, sandy beaches separated by rocky headlands. Paved footpaths and jogging trails stretch along almost the entire 5.6-mile length of the beach. Sculpture parks and ornamental landscaping offset the turquoise water and swaying palm trees to complete a picture-perfect scene. High-end resorts, spas, and seafood restaurants rub shoulders with simple guesthouses, funky bars, and humble cafés along the coastline, and a lively beach scene is the norm throughout the year. 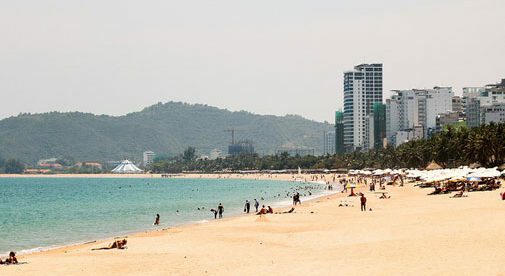 Nha Trang’s beach and amenities draw visitors year-round. 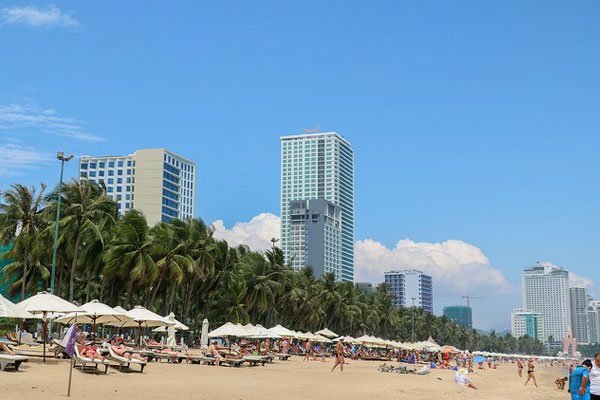 Nha Trang has the best climate for beach lovers in all of Vietnam. The average year-round temperature is 79 F. Temperatures rarely dip below 68 F or rise above 90 F. The winter months, from November through February, are cooler and drier than the rest of the year. Pleasant sea breezes moderate the hot summer weather. There is practically no air pollution. There are some major supermarkets in Nha Trang that carry local and imported foods. Moon Milk, near the tourist area, is the city’s largest imported food store; it carries a good stock of hard-to-find groceries, cheeses, and meats. For many items, including bread, local fruits, vegetables, local meat, and fish, you’ll find the best selection at one of the traditional markets. I went to the Xom Moi Market every morning for hot, fresh-baked baguettes, juicy mangos, and most of my groceries. You’ll find neighborhood markets throughout the city, too. Once you’re recognized by the vendors, you’ll be welcomed as a friend. Vietnam’s best hospitals are just an hour’s flight away in Ho Chi Minh City, but two new facilities in Nha Trang now provide international-standard healthcare. Vinmec International Hospital, which has several branches in Vietnam, opened a large, well-equipped facility in 2016. This squeaky-clean facility has inpatient and outpatient services, three operating rooms, and English-speaking staff. An appointment with one of its specialists costs $31. Tam Tri Hospital is a new, private hospital with an international wing that also gets high marks from Nha Trang’s expat community. Nha Trang is certainly one of the most beautiful places in Vietnam. There’s stunning scenery, a thriving expat community, well-developed infrastructure, and all the Western amenities you could want. Yet the cost of living here is amazingly low. Two people can easily live in a well-appointed, Western-style house or apartment within walking distance of the beach, have a housekeeper come in once or twice a week, eat every meal out, go to a spa occasionally, and live a solidly middle-class lifestyle for around $850 a month. French-style baguettes are baked in every village in Vietnam, but in my opinion, no place makes them better than Nha Trang. These crusty wonders are baked throughout the day and served at many restaurants still warm from the oven. My favorite Nha Trang breakfast is a bánh my—a fresh baguette filled with an omelet, meat, or pâté with pickled carrots and radishes, along with a strong cup of cà phê sua dá (iced coffee with sweetened condensed milk). These sandwiches can be bought from sidewalk vendors throughout the city for about 75 cents; add another 38 to 57 cents for the coffee. You’ll find an ample assortment of Western restaurants in the tourist area, and decent local fare, too. For some reason I’ve never understood, Nha Trang has some of the best Italian food I’ve tasted in Southeast Asia, and it’s offered by several restaurants in this part of town. City Pizza has always been my favorite restaurant for pizza, and Da Fernando has excellent calzones and pasta dishes. Cheers Bar, which is always full of expats, has excellent pub fare, big breakfasts, and it puts out a gigantic Sunday roast for less than $7.50. The Texas BBQ offers U.S.-style ribs, steaks, and outstanding breakfasts; it’s another place frequented by Nha Trang’s expats. Many expats living in Nha Trang spend their time socializing at one of the many bars and restaurants in town, such as Cheers, the Louisiana Brewhouse, or the Texas BBQ, where it’s easy to make new friends. There is also a Facebook group called Expats in Nha Trang, where you can find posts advertising events and activities. You’ll discover that it’s just as easy to make Vietnamese friends here. Since Nha Trang has been such a popular resort town for so many years, most locals are exceptionally welcoming and have a good command of English.